A little while ago I posted Micah’s “Wholesale Vegetable Prices” and there was some discussion as to what, exactly, 毛菜 (AKA 鸡毛菜) is. Well, just last night, as I started digging into what I thought was a tasty but otherwise ordinary dish of 香菇青菜 (Chinese greens with mushrooms), my ayi mentioned to me, “that’s 鸡毛菜, you know.” (I had asked her about it around the time of the veggie prices post, and she remembered me asking, so she mentioned it to me.) So I got a picture of it, since the internet apparently does not have enough pictures of this vegetable. 鸡毛菜 mystery… solved! Exciting! Wow, I managed to get in another post related to my ayi in between a series of posts about ayis. What is with all this ayi-mania on Sinosplice lately?? I don’t know, but just let me get it out of my system. You can’t keep this sort of thing bottled up. But seriously…I remember eating that. It was pretty good stuff. Wow! That surprises me now. We eat these greens in Hong Kong all the time, and I had thought them to be 白菜， Cantonese “bak choi”… simple Chinese cabbage in a young stage, thus they’re frequently called “baby cabbage” on English menus. Interestingly, my girlfriend from Beijing when in Hong Kong claimed never to have seen them before, and thus she couldn’t give me the Mandarin name for it. I was still convinced that it was “bak choi”, thus “bai cai” – and she didn’t know it for the simple reason that it wasn’t eaten in such a young stage on the Mainland. On Google, do an image search for 白菜，you’ll find Chinese cabbage. Do a search for “bok choi”, you’ll find something different (look at the sixth picture especially). And now 鸡毛菜? Mysterious! Sinosplice, launch a large-scale investigation! In the San Francisco Bay Area, this is commonly called “baby bok choy” and can be found in the food aisle of many large supermarkets. When my parents first began buying this particular variety a few years ago in the Asian food markets, I remember my mother referred to it as “Shanghai bok choy.” Either name is fairly common. However, I have never heard of it being called “雞毛菜”, either in the grocery stores or local Chinese restaurants, but perhaps I haven’t looked hard enough. We call it ‘brede de tom pouce’ in my country… Tastes okay I’ll say. I guess I ate too much of this when i was younger. My parents (Chinese) love this. I rarely eat it in Shanghai. Look at those slimy vegetables coated in oil. Yuck! While I was living in Korea, Koreans would describe Chinese food as oily. After I moved to China, I found out why. Whenever I’d ask the cook to prepare the dish with little oil, they’d complain, “But it won’t taste good.” Somehow the Koreans manage to make veggies taste great with just a little sesame oil and spice. As with Andrew I found it very commonly in the Bay Area and assumed it was pretty common everywhere. To my mind it’s the best green – but I also really like Brussel Sprouts, so perhaps my opinion can be discounted. My wife cooks with 鸡毛菜 all the time. We can get it at the Asian markets around Sacramento and at the farmers markets in the summer. We always call it 小白菜。She blanches it then minces it up with 香菇 and 猪肉 to make the most awsome Sganghai style wonton soup you never had! You can buy ji mao cai in supermarkets here in Adelaide and it’s simply called bok choy (whether this is the correct name or not). I wondered this when you first brought up the mystery but for some reason discarded the idea. This looks sooooooooooo nice!!! God I miss Chinese food so badly. Chinese food here in Canada is expensive (well i am a university student, what do you expect) and not authentic to say the least. I’ve been looking around the Web and I found a seaweed that seems as though it goes by the name of jimao cai… http://seaweed.ucg.ie/descriptions/Ptecap.html But this is not what I have seen called jimao cai in Shanghai. I remembered it was called ” Shanghai baby Bok Choy” when I was growing up in TianJin. However, different regions in China sometimes have different names for the same vegetable. For example, tomato is called “xi hong shi” in TianJin, in Hong Kong it is called “fan qie”. This vegetable has been gaining popularity in Southeast Asia, although we have to import it from China. In my dialect (which’s sort of a mix between Cantonese and Mandarin) is called buai-leng, but I believe it’s bok-choi in Cantonese. You can also eat it hot-pot style. It makes the broth very sweet. Looks to be what my parents would call “Cantonese bai cai”. BTW, “xi hong shi” is the Commie term for tomato. It’s called “fan qie” not only in HK but also Taiwan (and in the overseas communities). Sort of how Americans and Brits call the same thing corn and maize. I asked my Chinese friend today. She knows both Cantonese and Mandarin and confirmed that bok-choi = bai cai. So mystery really solved? Xihongshi is no Commie term, otherwise it would have been called Donghongshi wouldn’t it? Persimmons are grown in the North, but not in HK or Taiwan, so it only makes sense that barbarian eggplant would be used instead. I wonder if the Japanese and Korean terms for tomatoes have a persimmon bent as well? Everyone at the market just calls them 柿子. They do look more like persimmons than they do eggplant, I’m afraid. The Korean name for tomato is derived from English, which makes sense since the tomato is native to the Americas. Ok, that’s not called 鸡毛菜. Your ayi is wrong. This is simple baby 白菜. The real 鸡毛菜 is much thiner than this. I grow up with those stuff and I know my favor vegi. So far, I haven’t seen it in the north east part of the states. I think fish is right. 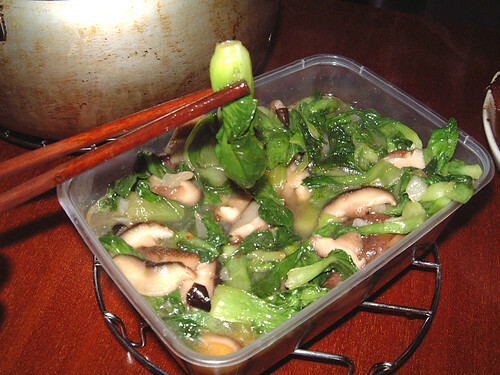 Real 鸡毛菜 is not the same as Shanghai bok choy, which seems to be what is pictured up top. It is more like 小青菜, and it may(?) be the same. The leaves and the stems are certainly thinner than more mature 青菜. It is easily distinguished from 白菜, which is much thicker and mostly white. My wife, a Jiangsu native, and I have found it in Flushing grocery markets during the spring and summer months, but not frequently. Our timing needs to be right. We live in Boston and have never found it in the markets up here.